Maps Mania: Do Laptops Dream of Slippy Maps? You're probably getting bored of Deep Dream images by now. So let me introduce you to Deep Dream Mapping. My first thought on reading about Google's Deep Dream image neural processing was to wonder how the software would interpret an image of a map. So I fed Deep Dream a map of Washington DC and this is what it saw - Deep Dream Washington DC (the map was created by using the Google Maps API's groundoverlay). It turns out that I wasn't the only one who wondered 'Do laptops dream of slippy maps?' OpenStreetMap user 'chippy' has also fed some map images into Seep Dream. His Deep Dream Maps in OSM entry on the OSM blog includes Deep Dream maps of Liverpool and Leeds in the UK. To be honest the results of my own Deep Dream map was a little disappointing. My map image didn't seem to produce great dreams. I therefore thought it would be interesting to use Leaflet.js as a way to view a more freaky Deep Dream image. Here's my Leaflet Deep Dream self-portrait. I didn't bother creating map tiles for the image. 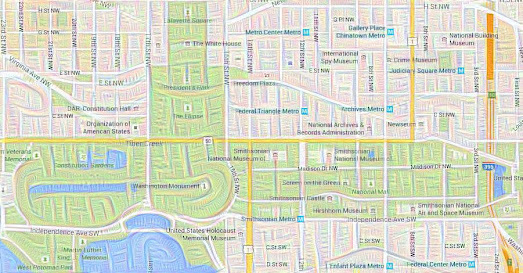 If you do create map tiles for a Deep Dream image then Leaflet.js would be a nice way to provide a zoomable and pannable interface for your own disturbing Deep Dreams.